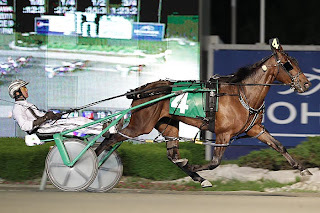 The next big test for the glamour-boy pacers is set for two weeks and this Saturday, July 9, there are 19 battling for berths in the $1-million Meadowlands Pace. Two $50,000 elimations are on the program to settle the field for the final. Meanwhile, the glamour-boy trotters and their filly counterparts are analyzed for this weekend’s Yonkers Trot and Hudson Filly Trot stakes action at Yonkers. Check out our Hambletonian Trail blog and the Hambletonian Society’s exclusive coverage of all the action, before and after, of both divisions. Saturday night wagering the Meadowlands at TwinSpires features 2X points, so read through the blogs, load your account and be ready to bury some numbers and build up the points. The top five finishers in each of the two $50,000 Meadowlands Pace (MP) elims will advance to the track's signature event on July 16. North America Cup-winner Up The Credit is in the first elim, coming off a short rest taken after a four-race winning streak. “Credit” is five-for-six on the season with earnings of $899,300. Trainer George Teague, Jr. sends out a quartet of pacers, with our Hoosier Cup-winner Custard The Dragon leading the group in elim one. Wink N Atcha, also in the first elim, has the harder of the tasks. Custard The Dragon was great in Indiana and is in good shape to make it into the final, if not win his elim. Certainly Credit will be getting the most play, so “Custard” looks very valuable against him. Feel Like A Fool and Wind Me go for team Teague in elim two. Trainer Jimmy Takter has three going. High Noon and Rollwithharry take the stage in the first elim. Great Vintage is his other chance, though not a good one, in elim two. Not to be ignored is the other colt we have been successful with this year, Powerful Mist (left). He has never stopped being sharp so far, with excuses for his losses, including the North America Cup. He may be the public choice in elim two, as Big Jim might not get the kind of backing he promised as the early-season favorite to go all the way in the MP. A special attraction in the second elim is the first filly to attempt a MP win. No, it is not See You At Peelers. It is trainer Ross Croghan’s Drop The Ball. She finished second in two of her three starts this season. 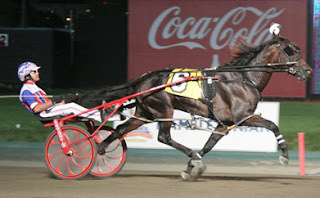 Last year at the Meadowlands, she set a 1:50.4 track record in the Countess Adios for frosh-filly pacers. In her most recent start, she came home in a startling :26.3, finishing a nose behind Showherthemoney’s upset in a conditioned race at the Meadowlands. Undefeated soph-pacing filly See You At Peelers (left) will pass the MP and take on her own division at Vernon Downs on July 9 in a New York Sires Stakes mile. 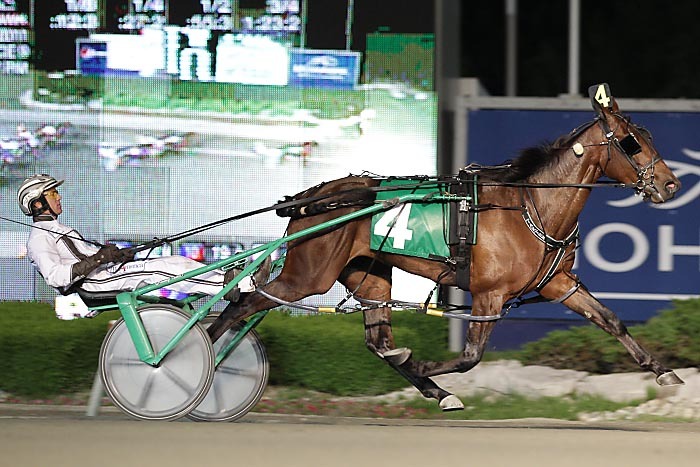 After winning the $600,000-plus Fan Hanover at Mohawk, “Peelers” comes into the race without a loss in her career; in this event she appears to have little competition to ruin the skein. The chase includes Arlington Ave, Busybeingfabulous, City Delight, JK Soundofmusic, Lisjune Ann, Sight To See and Whats New Pussycat.